When I was but a wee lad, I came across a musty old collection of short stories by Edgar Allan Poe in my grandfather’s den. I can still remember the withered feeling of the cover and its pages as I leafed through the volume, reading out loud the titles of the stories as I went along. “The Black Cat.” “The Masque of the Red Death.” “The Tell-Tale Heart.” Each hinted at something terrifying, piquing my fledgling curiosity in all things morbid. I began to devour the stories, taking the book with me everywhere I went. Everything Poe was saying about the dark side of humanity and the nature of the perverse went completely over my head at that age, but it still managed to blow my mind into a thousand little bits. The Premature Burial features the comic book treatment of two Poe short stories: “The Cask of Amontillado” and title story itself. 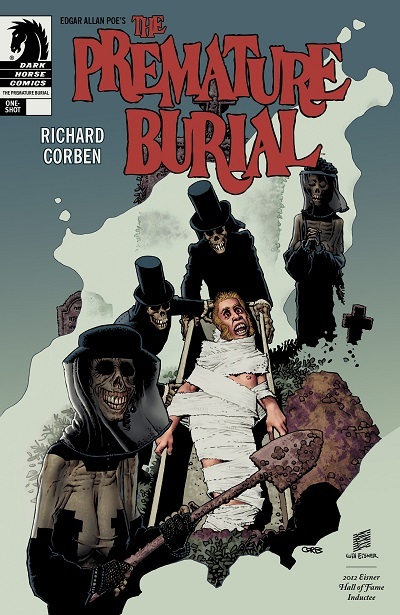 This one-shot was a project of the renowned artist Richard Corben, who both illustrated the tales and adapted them from the source material. From a visual standpoint, it’s a great success; Corben’s art is rich and moody, tweaked slightly at times and flat-out unhinged at others. It’s everything a Poe fan would want in an adaption such as this, giving his work the demented pulp feel that it has enjoyed in the past with other revisions. That’s the good news. The bad news is, in terms of a storytelling, it falls pretty flat. “Amontillado” is fine, offering a brisk retelling of a classic story of deranged revenge. It even manages to build up some suspense, even though it breezes along far too quickly towards its morbid climax. Where the book really runs into trouble is in the title story. There are a few pages in “The Premature Burial” that are a layout nightmare, resulting in a muddled and erratic feeling. Plainly put, it’s a bit too confusing and leaves you struggling to figure out what the hell is going on, even if you’re already acquainted with the original story. The small anthology definitely has some interesting ideas, like the character of Mag the Hag who is supposed to serve as a host for the tales’ wraparound, but they’re not executed in a way that pays off. Overall it’s a visually pleasing but ultimately disappointing attempt at bringing new life to Poe’s work. Depends – If you’re a fan of the artwork of Richard Corben, then you might want to pick this one-shot up. Its pages are beautifully rendered and are the things nightmares are made of. Unfortunately, if you’re more interested in the two Poe stories, you might be better off reading the tales themselves rather than this adaption.